A while back the Tiny House Blog posted a job offering for a tiny house owner to be a campground host in California. Scott Sherman heeded the call and has been the host for the Inn Town Campground in Nevada City for a few years. 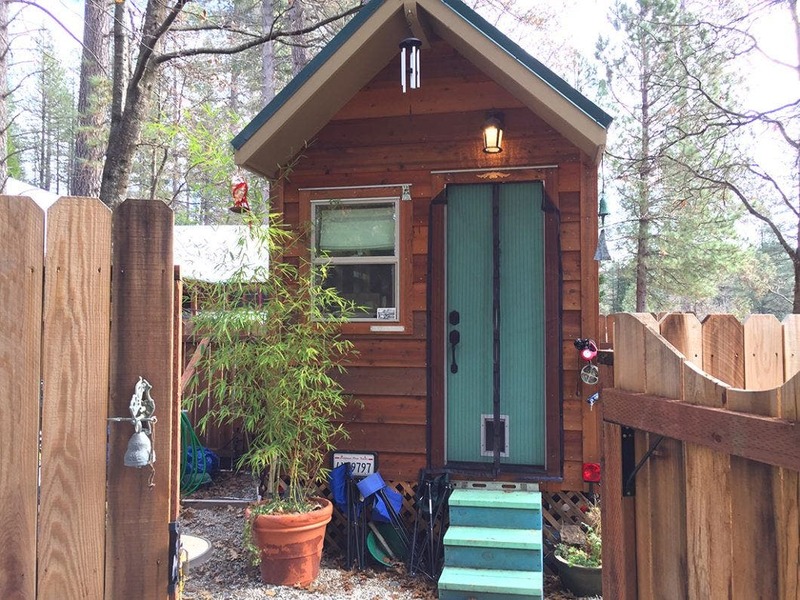 Take a tour of his tiny house and life in the Sierra Nevada foothills. Scott Sherman is a camp host at the Inn Town Campground in Nevada City, Calif.
Scott, an independent therapist, lives in a 25 foot long, 300 square foot tiny house built by Liberty Cabins of Anderson, Calif. Scott purchased the house for $50,000 three years ago after he and his wife divorced and he moved to Eureka in northern California. 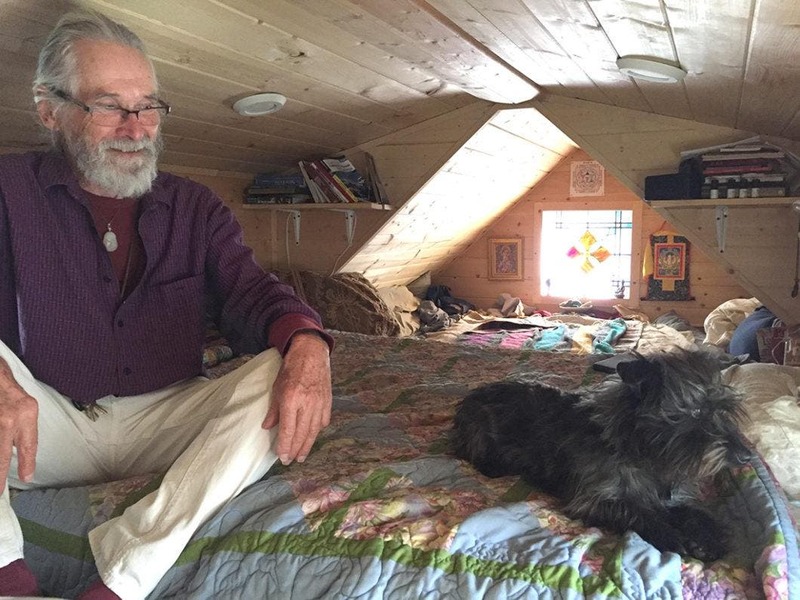 Scott and his dorkie, Dante, in his loft/meditation space. While waiting for several months for his home to be completed, Scott traveled around the U.S. and Mexico with his dog, Dante. When he picked up the home, he brought it directly to the Inn Town Campground and got set up as a host under the oak and pine trees at the front of the camp. He works about 13 hours a week in exchange for the site and utilities. His job is to keep an eye on the campground at night, check in late guests and visit with guests at their campsites. 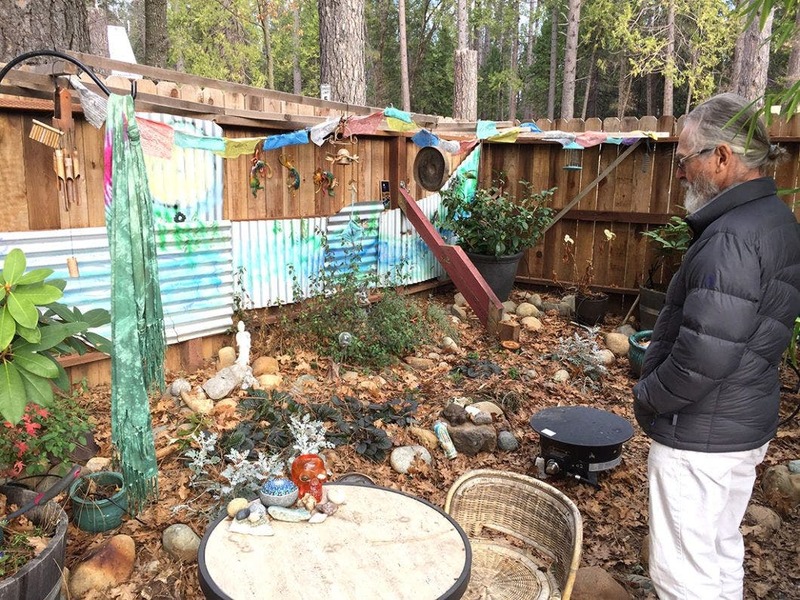 The tiny side yard is decorated with prayer flags and unusual stones. 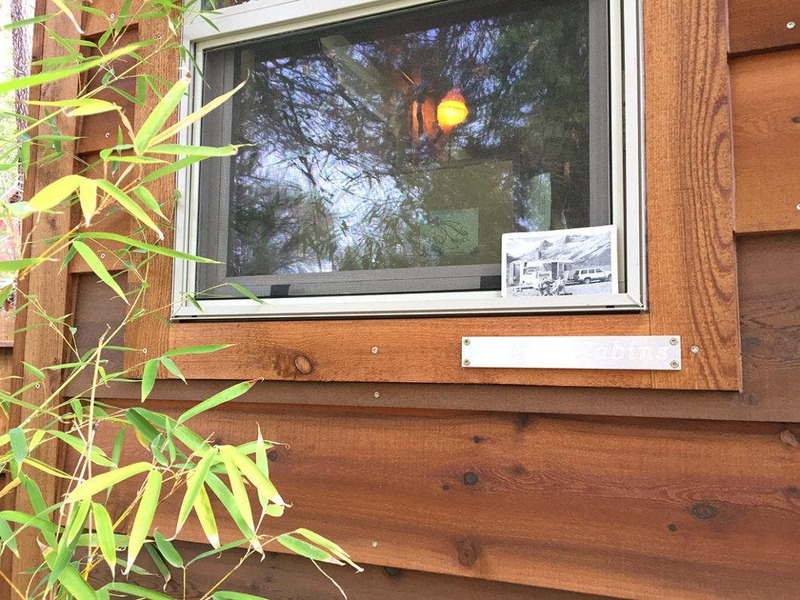 The campground owners, Erin and Dan Thiem, built a small fence around the tiny house for Scott to have more privacy and a tiny garden. 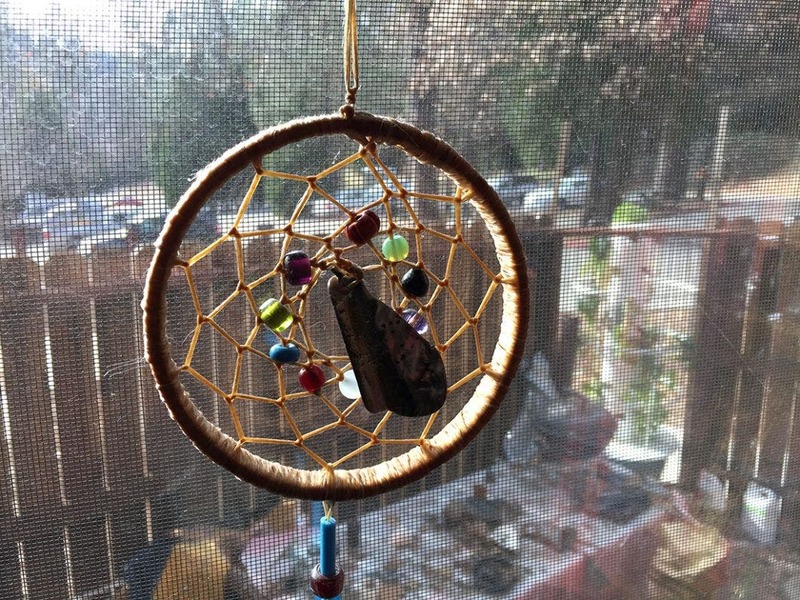 The garden is decorated with wind chimes and unusual rocks he has picked up during his travels. He also has a small storage shed off-site. Scott works about 13 hours a week in exchange for his site and utilities. 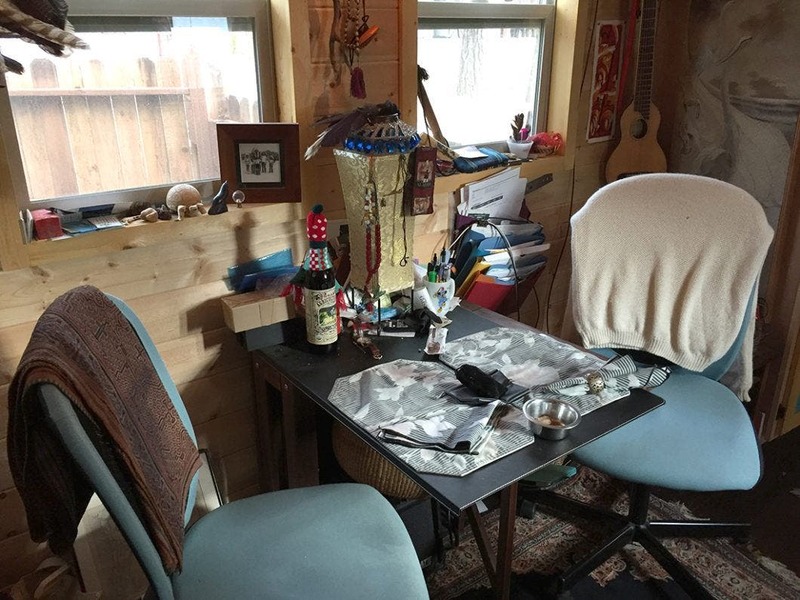 The main room holds Scott’s desk, musical instruments and paperwork. Scott finished the kitchen cabinets and removed the microwave for extra storage. Mason jars of beans and grains are tucked against the roof. The bathroom contains a full shower and standard toilet. The closet has plenty of space for clothing. Named the “Blue Heron’s Nest”, the house has a large loft bedroom complete with queen bed and a yoga and meditation space with a vintage stained glass window from Great Britain. 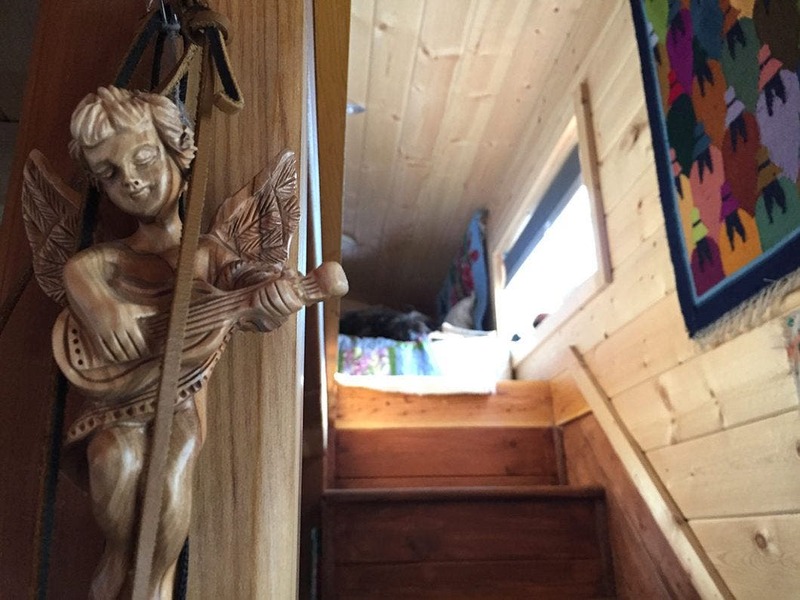 The loft is accessed by a staircase rather than a ladder and the house has plenty of storage under the stairs. The living area does not have a couch, but it does have a dining area for two that is also Scott’s desk and entertainment area. The bedroom loft is accessed by a staircase. 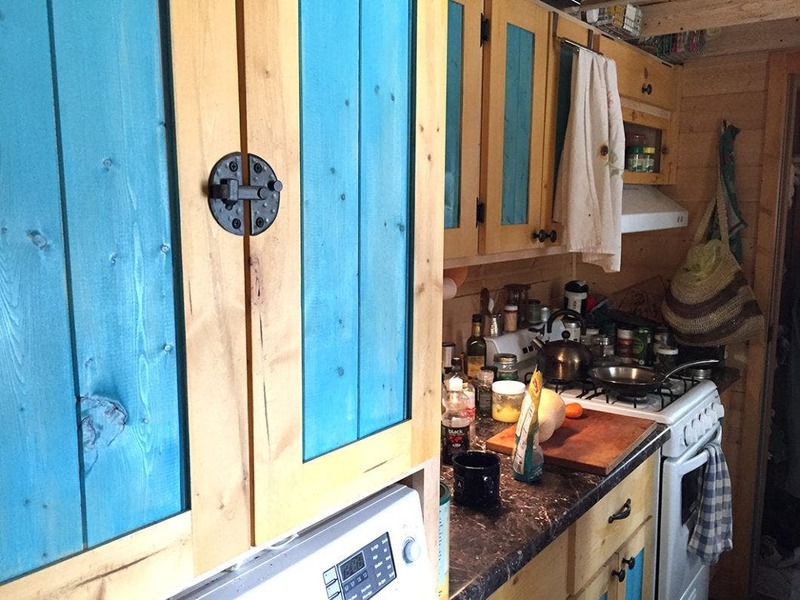 The tiny kitchen also has plenty of storage and Sherman has found unique ways to store food. 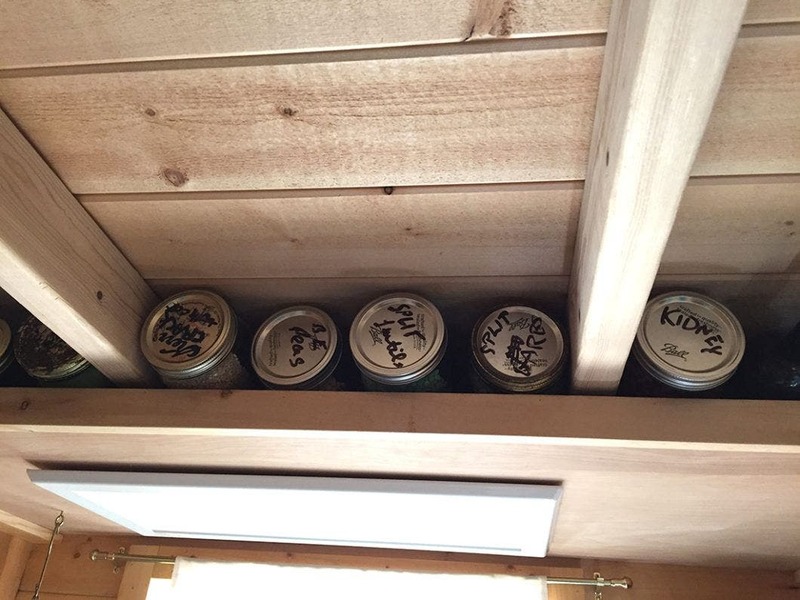 He uses the space between the roof and the wall to store Mason jars full of grains and beans. The kitchen also has a washer/dryer combo. 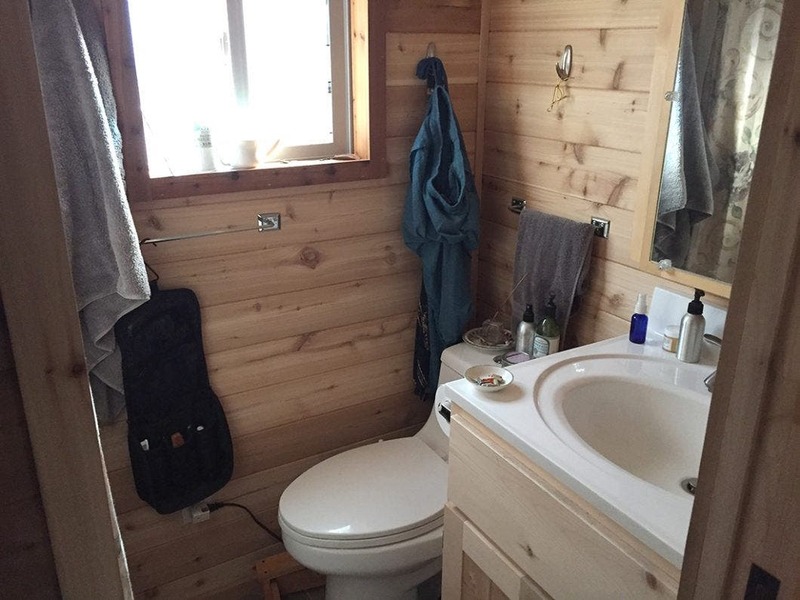 The bathroom has a standard toilet, sink and roomy shower. 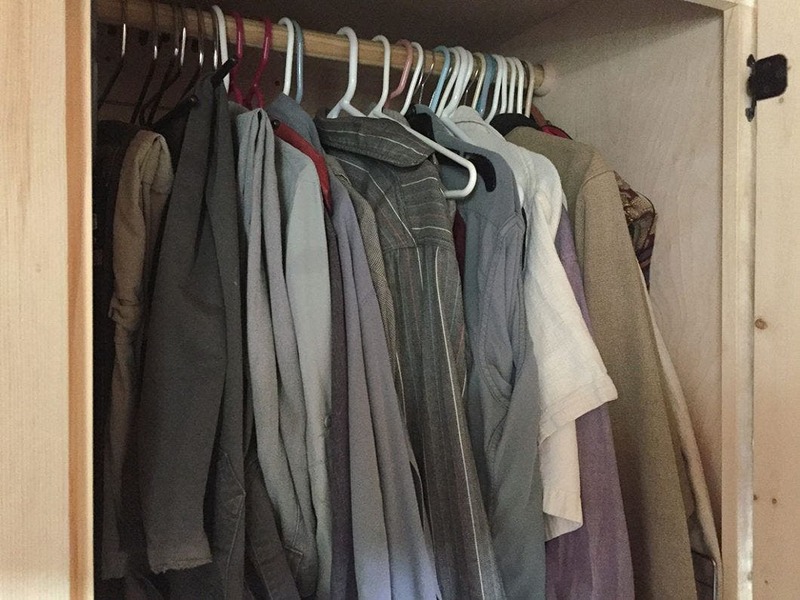 A closet by the kitchen fits plenty of clothes and Scott admits he still needs to purge more. 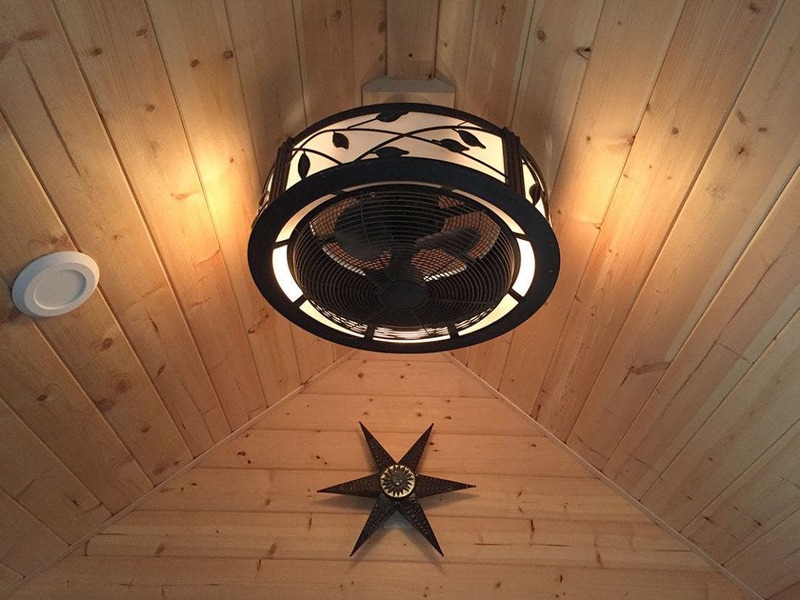 Scott’s handmade treasures and found items decorate the interior and exterior. 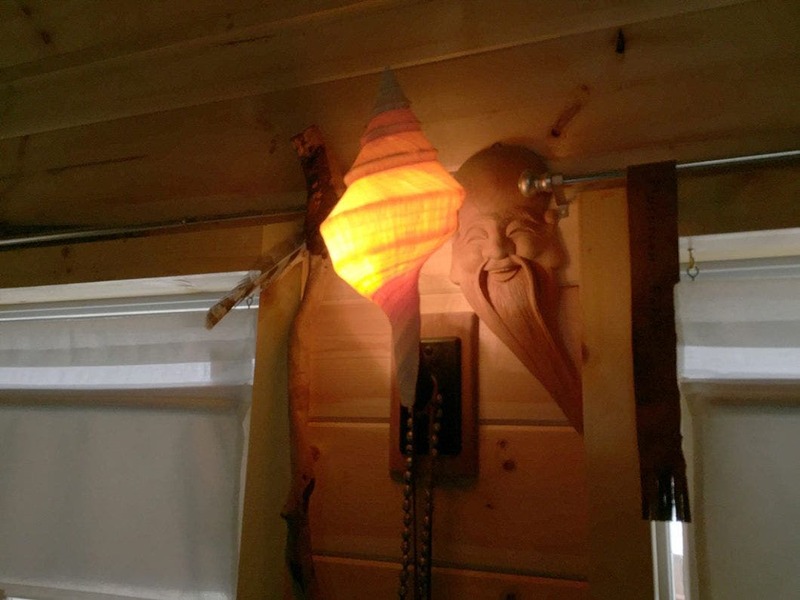 As a musician, artist and admirer of unique, handmade items, Sherman’s home is a tiny alter to the items that mean the most to him. 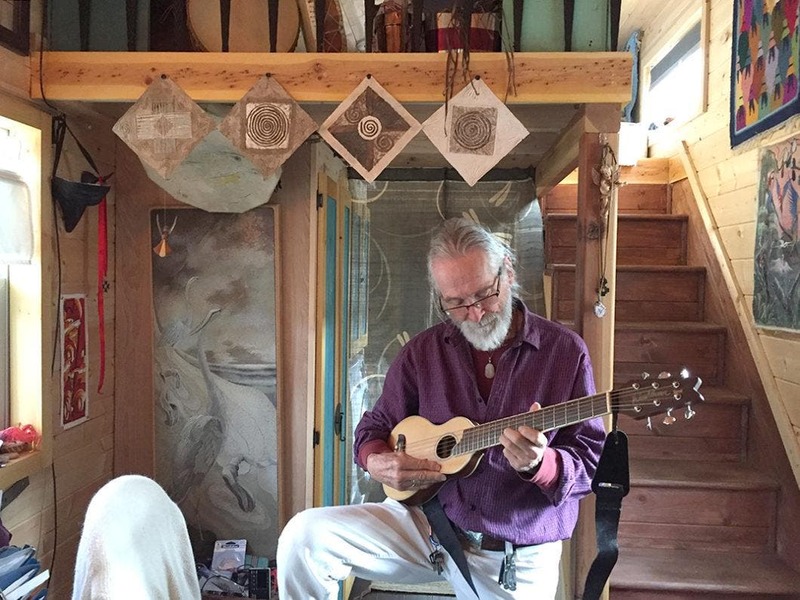 Several times a week, Sherman receives curious visitors to his campground home on wheels. He says that people are charmed and fascinated by his house and living arrangement. 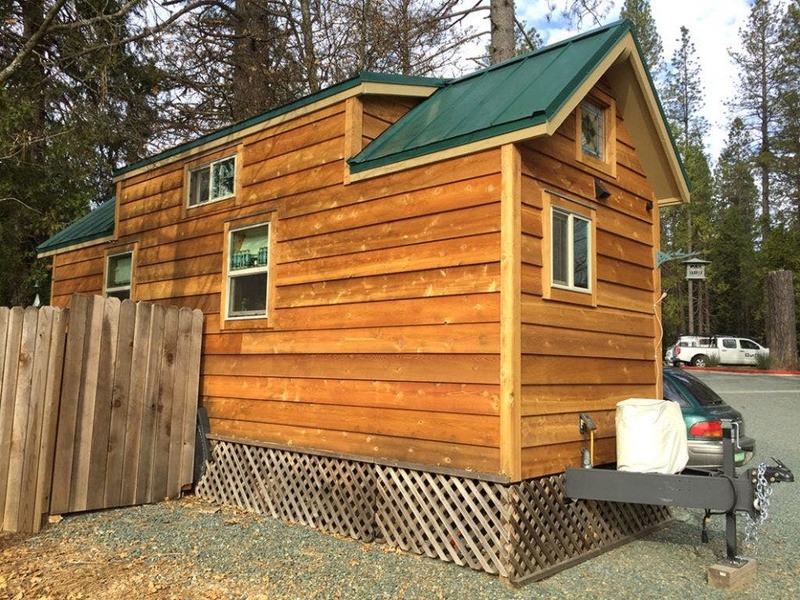 Do you know of Tiny house communities for disabled folks?